Hello people, yesterday I said I fancied doing a lipstick review so here it is! 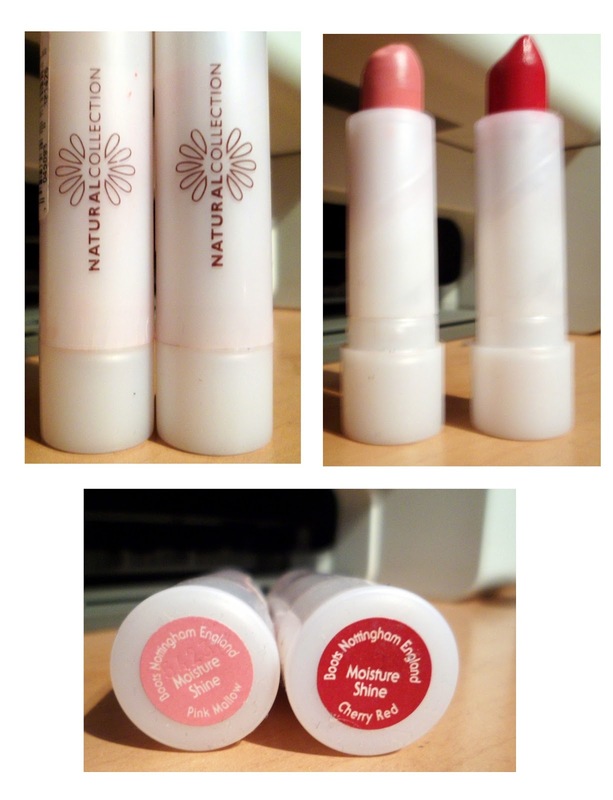 I decided to review my two natural collection lipsticks because I really like them and thought i'd share my feelings with you. I've had no beauty training or anything, i'm basically saying my opinion :)! The shades are both lovely, I tend to wear the cherry red more at night but I have started wearing it during the day too. The pink mallow is a lovely subtle shade which makes my lips feel super shiny. People often compliment me on it too. Packaging: I've had both these lipsticks for quite a while and the packaging is still in the same condition. Personally i'm quite surprised at this because I don't really look after them. I chuck them in my bag, bouncing around everywhere so I think it's pretty sturdy stuff. It's quite plain too which I don't really mind as I think who the hell sees it. It's similar to all the Natural Collection products which makes it easily recognizable. The Good Parts: The price! These were £1.99 which for a lipstick is excellent. I can't find them on the Boots website anymore to put a link up but i'm pretty sure I saw them in there the other day. This collection is the 'moisture shine' and I believe it works, I didn't need to use a lip gloss over the top or some lip balm underneath to moisturise as the product definitely does it for you. It also stays on for quite a while too which is definitely a plus. I tend to wear the red one for nights out and I only have to top up once usually. I think the pink mallow shade lasts a tiny bit longer than the cherry red shade for some reason but i'm not too sure why. The Bad Parts: Okay, well i've already said that this product lasts for a while however when it is beginning to fade especially cherry red shade only disappears from the middle of the lips and can leave you with a lovely yet embarrassing red edge around the lips. It kind of looks a bit like you've gone out only wearing lip liner, not cool! But just keep an eye on it and top up every few hours and it's perfect! Score out of 10: I would give these lipsticks probably a 7 out of 10. You cannot go wrong for the price so I would definitely recommend you to buy some, especially for day wear lipsticks. Currently Boots are running a 3 products for £5 on Natural Collection brand too.